I saw this on The Simpsons the other day and I couldn't believe what I was seeing. Banksy - the infamous graffiti artist is now a household name. That is amazing that an artist is so revered he is on The Simpsons! well - this post isn't about that, it is about the work Banksy makes. I first saw his work from a friend who had a book about him. After looking through a few pages I quickly saw what he was all about. The cynical and clever work he produces is incredibly moving. He makes such a statement with spraypaint. 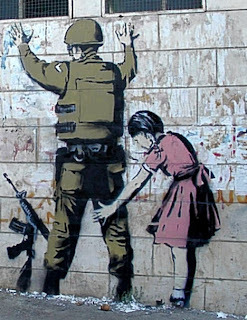 If there was a way to use art as a weapon, I think Banksy found it.